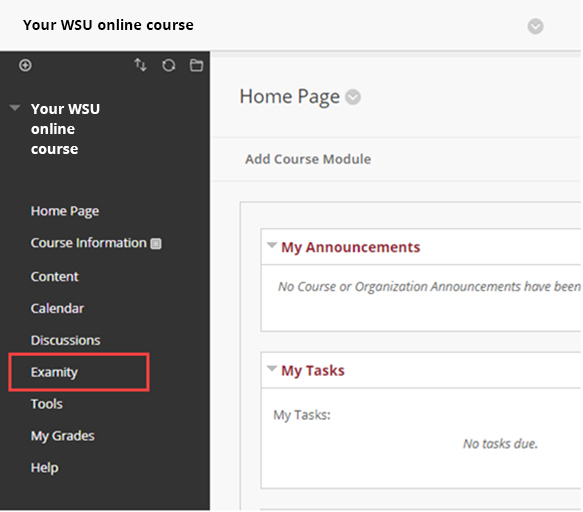 Examity is the Proctoring Vendor WSU has partnered with to proctor online exams for the 2018-2019 year. Global Campus instructors who would like to have Examity proctoring in their course should request them during the course verification process. Non-global campus instructors should reach out to Cheryl Esselen at cesselen@examity.com. Examity is integrated with Blackboard. You can access your Examity dashboard directly from your Blackboard course space. Examity will provide you with incident reports if they suspect a student of cheating, so you will be informed of any issue. You can review all recorded exam sessions within 30 days. Exam sessions are flagged to indicate concerns (see below for more detail). Through your Blackboard course space, tools link, you can connect to your Examity Dashboard. As Global Campus will continue to communicate all exam details (open/close dates, passwords, course specific rules etc.) to Examity, including accommodations you will be primarily interested in the Exam Status and Reports tables. Check the status of scheduled, completed, and proctored exams by clicking “Exam Status” in the Examity dashboard. You can see which students have completed their exams and whether or not they had any violations. This is also where you view any student violations. You can watch videos of your students taking their exams by clicking the blue “View” link. If the “View” link is not clickable, that means the exam has not yet been audited. All exams will be audited within 48 hours of the student completing the exam. If a technical issue arises, we will communicate that to you with a blue alert. Test Summary: Provides data on how many exams are scheduled. Wait Times: Shows how long it takes for students to connect to a proctor. Evaluations: Students are prompted to take a survey after they have completed an exam. Here you can see how they are rating Examity services.